Q11. If one have two TV sets in his house, will he need two set top boxes? watch different programmes on multiple TV's in their house, each individual TV will have to be connected to its own set top box. Q12. How is the DTT set top box installed? Q13. Can we receive DTT Signals in Laptop/PCs and Smart Phones? The Laptops/PCs can receive DTT Signals using Dongles. The some of the dongle manufacturers include PCTV, Altobeam, Tevii etc. Similarly Dongles for smartphones are under development and their commercial launch is expected by July 2014. The Dongles may be embedded by manufacturer inside the Laptops/PCs and smartphones by the end of year 2014. Doordarshan will be capable to start the mobile TV from September 2014 onwards. Q14. 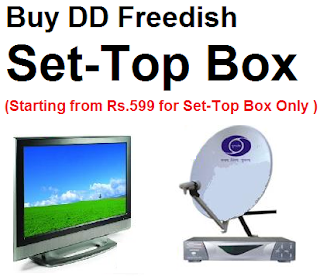 Why to go for DTT, when there are number of Programme Channels available in the Cable TV and DTH? DTT is like a banyan tree, which is fast evolving. It is an all weather reliable mode of broadcasting and only mode which is capable for fixed, portable and mobile reception as well as single transmission system is capable to relay Radio, TV and Data. We may relay SDTV as well as HDTV Programmes with same DTT. DVB T2 Standard has been adopted/deployed in 146 countries in the world. So there is large support for technology and receiver. In view of its data capacity, flexibility and robustness of Digital Terrestrial TV Transmission, no country in the world has disbanded the terrestrial transmission.